Synopsis: Nemeses! Dragons! Science! Symbolism! All these and more await in this brilliantly subversive, sharply irreverent epic from Noelle Stevenson. Featuring an exclusive epilogue not seen in the web comic, along with bonus conceptual sketches and revised pages throughout, this gorgeous full-color graphic novel is perfect for the legions of fans of the web comic and is sure to win Noelle many new ones. This is the first time I’ve ever read anything like this. I’ve never been a huge comic fan so I didn’t really have any expectations, I just knew I needed to read one to tick a box for a challenge and this seemed to be appearing on my feed a lot. I actually ended up really enjoying this entertaining and quick read. There are moments of pure hilarity and I loved how sassy Nimona was as a character. I also liked how the themes of hero/villain were approached in the story, breaking from the more traditional approach. There were also plenty of sad moments and I enjoyed reading a little about Nimona’s background. I thought the illustrations were excellent and I liked the use of colour to represent different locations and stages in time. I loved that what originally seems like a light-hearted comic turns into a story which brings to the surface questions about heroes/villains, friendship and morals. As well as being funny and having great characters, I really thought the story of this graphic novel stood out and made for a really interesting read. I thought this was a really well written and creative piece that I found myself really enjoying, despite it being outside of my normal comfort zone. It has definitely made me realise I could potentially enjoy other graphic novels in the future. 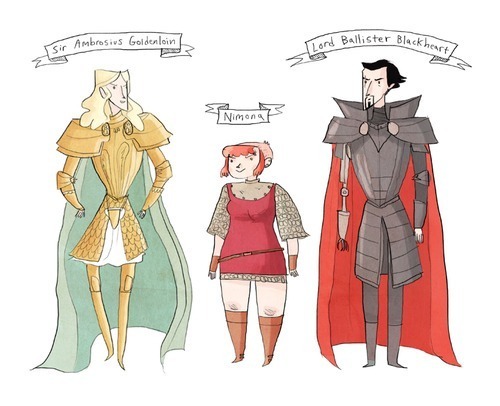 Have you read Nimona? What did you think? I love this graphic novel so much! I’m so happy to hear you enjoyed it! I love how it breaks all the tropes of a typical hero vs villain story. If you liked this you may like Noelle’s other series called Lumberjanes. 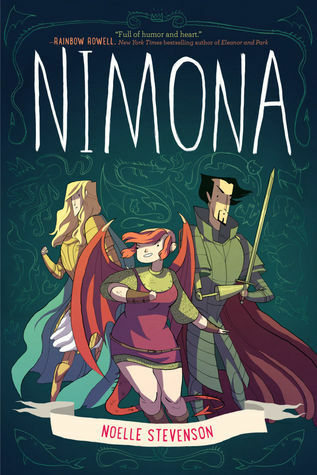 It’s a lot more fun and crazy than Nimona, but it definitely has the same sort of feel.